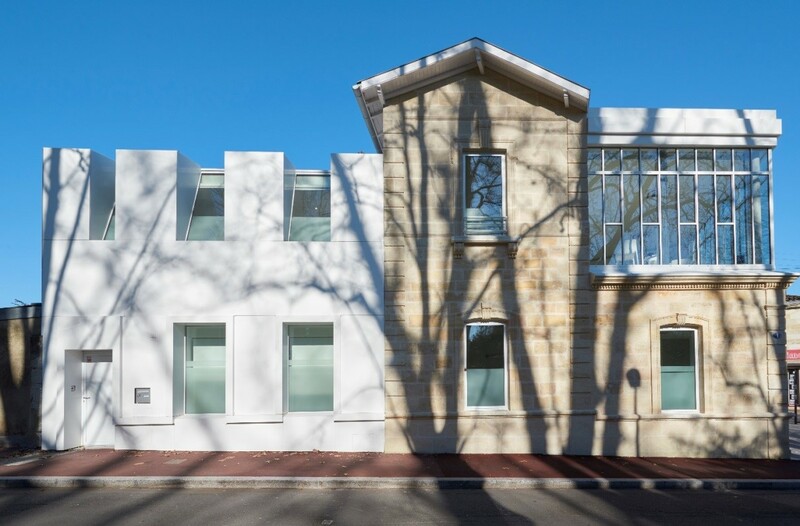 BüPA Architectures have transformed a dental clinic in Bordeaux (Gironde-France) by renovating the existing building and grafting on an additional floor, covered entirely in Corian® high tech surface material. 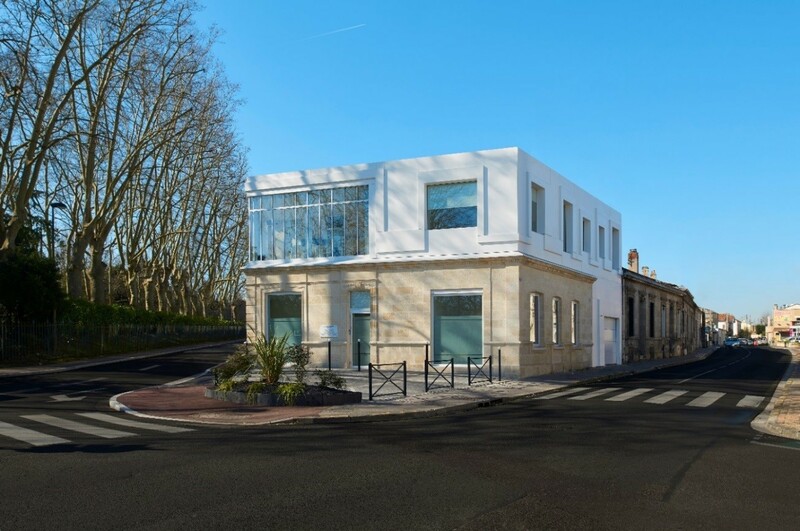 BüPA Architectures have transformed a dental clinic in Bordeaux (Gironde-France) by renovating the existing building and grafting on an additional floor, covered entirely in DuPont ™ Corian® high tech surface material. Corian® exterior cladding at the Eric Normand dental clinic in Bordeaux. Courtesy of the agency BüPA Architectures, photo Denis Lacharme, all rights reserved. Choosing Corian® in Glacier White colour to clad the building, which covers a total area of ​​450m2, architect Frantz Bülher was seduced by the exceptional freedom of expression offered by this high tech material. He was also impressed by its durability, having seen the Corian® façade of the Seekoo hotel in Bordeaux (also in Glacier White colour): few materials retain such intensity of white over time. One of the exceptional elements of the renovation is that the DuPont ™ Corian® cladding is on a wooden frame, which is a real technical innovation. Seventy panels of Corian® (in Glacier White colour) were processed by fabricator Ateliers St-André (ASA) to create a façade without visible joints, which integrates exterior moldings around the windows. DuPont ™ Corian® exterior cladding at the Eric Normand dental clinic in Bordeaux. Courtesy of the agency BüPA Architectures, photo Denis Lacharme, all rights reserved. Ateliers St-André (ASA) were also responsible for the broader technical feasibility of the project, the timber frame and all on-site implementation. The work was conducted in close collaboration with the DuPont ™ Corian ® technical centre – covering the expansion stresses, sealants and fixings, as well as aesthetic aspects – ensuring the success of this unprecedented use of Corian®. Cleverly integrating the existing stone, DuPont ™ Corian® creates a perfect synergy between the old and new architectural elements. The joints are invisible, which enables a beautiful flowing design. The smooth, immaculate appearance of Corian® enhances the medical function of the building while bringing a modern touch to the traditional Bordeaux architecture of the existing building. The futuristic interior space of the clinic reflects the philosophy of the owner Eric Normand, a dedicated and passionate practician, and incorporates the latest technological advances. The flexibility of DuPont ™ Corian® has allowed the architect to design a curved reception area, fabricated by Ateliers St-André (SAA), that contributes to the high-tech environment. In the reception area – and also the kitchen and laboratories – furniture in DuPont ™ Corian® Glacier White sculps the interior while different finishes (matt or polished and shiny) create added visual interest. Laboratory countertops made of DuPont™ Corian®. Photos Ateliers St-André (ASA), all rights reserved.